Game of Thrones fans may not be able to travel to Westeros, but they can book a trip to the places where the hit HBO series was filmed. In anticipation of the premiere of season eight of Games of Thrones on April 14, why not take a trip to Croatia to see the featured locations from the show? Croatia was a popular seaside vacation spot long before the arrival of Game of Thrones, but HBO’s world-dominating series certainly turned things up a notch. These days, there can’t be many visitors to Croatia who aren’t aware that tons of footage were filmed here. Fantasy fans travel from all over the world to the site of Fort Lovrijenac in Dubrovnik, which doubles as King’s Landing in the series, but there is a bunch of other filming locations spread across this gorgeously cinematic country. 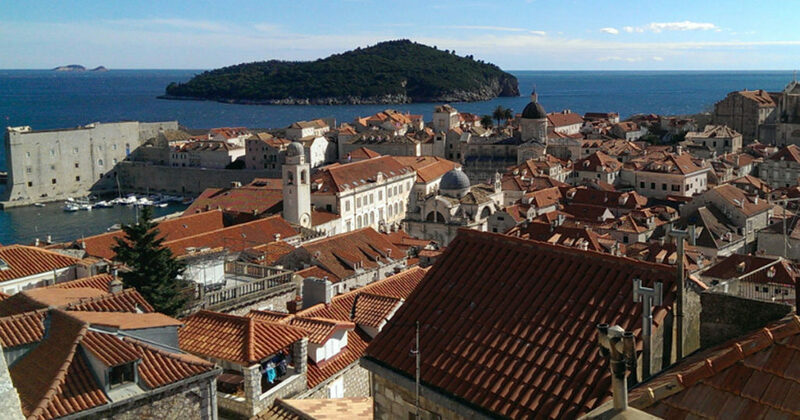 Take a tour of real-life filming locations with our Game of Thrones guide to Croatia. Something of a mecca for fans, Fort Lovrijenac is perhaps the most notable of Dubrovnik’s filming locations. Jutting out proudly over the crystal-clear Adriatic Sea, this handsome fortress is the palace known as Red Keep, appearing in the background of plenty of scenes involving King’s Landing. Its interior courtyards were also used as the backdrop for the tournament celebrating King Joffrey’s name day in the second series. The King’s Landing garden scenes were mostly shot in the sea-facing Trsteno Arboretum. These manicured botanical gardens are an insurgence of colorful blossoms and vibrant greenery. The Arboretum also boasts a treasure of Renaissance-era garden architecture, giving visitors a splendorous insight into the visual history of the real-life 16th century Croatia. Once owned by the noble Gucetic family, it is one of the oldest arboretums on the continent. Dubrovnik’s walled town, with its tangle of cobbled lanes and tightly crammed stone houses, is where Game of Thrones’ bustling market plays out, as well as scenes where the City Watch skulk around King’s Landing. It’s also where the murders of King Robert’s illegitimate sons happen. Nearby, Jesuit staircase is where Cersei Lannister takes her naked walk of penance in season five. Diocletian’s Palace is Split’s architectural Roman centerpiece: a chaotic confluence of winding marble streets and stone buildings. Thrones fans will recognize it as Daenerys’ throne room where she keeps and trains her dragons. It is also where the slaves rise up in mutiny against their masters in season four. The lanes around Dioklecijanova double as the streets of the besieged Meereen. A stone’s throw from Dubrovnik, Lokrum is an uninhabited island teeming with lush vegetation and historical ruins. Covered in lowland forest and flanked by rocky beaches, its focal point is a ruined Napoleonic fort and botanical gardens set up by the Habsburg royal Maximilian. It plays an important role as the ancient port city of Qarth in season two of Game of Thrones and as the location of Xaro Xhoan Daxos’s garden party held in the pine-fringed boulevard. These are some of the noteworthy places to tour when you are visiting Croatia and with the help of Tour the Game of Thrones, you are sure to get an action-packed visit with an understand of filming locations of the hit show as well as some amazing history of Croatia that will keep you coming back for more. Tomislav was so great! We had very limited time in Dubrovnik because of our cruise schedule. Tom was so fantastic. He got us to all the awesome Game of Thrones sites as quick as he could, despite our tight schedule. He was polite, insightful, and spoke good English. We wish we could have spent more time with him, as he was very knowledgeable about Dubrovnik and Game of Thrones. Thank you, Tom!